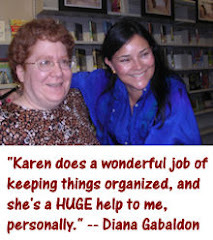 2nd Annual OUTLANDER Photo Contest! It's official! 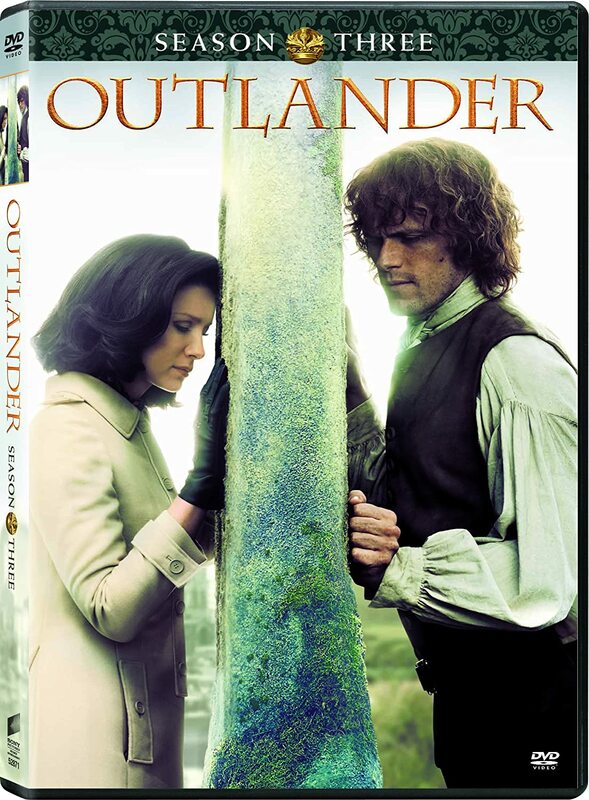 Sam Heughan IS Jamie! Sam Heughan as Jamie Fraser! It was raining outside; a light rain, but the air was cold and damp enough to make the cozy nest of quilts more inviting than the distant prospect of hot coffee. Particularly since the getting of coffee would involve a trip to the stream for water, making up the campfire--oh, God, the wood would be damp, even if the fire hadn’t gone completely out--grinding the coffee in a stone quern and brewing it, while wet leaves blew round my ankles and drips from overhanging tree branches slithered down my neck. Here's a video demonstrating how to use a quern. If you want to try making your own quern, you can find step-by-step instructions here. 2) Claire was able to diagnose Aidan McCallum's acute appendicitis by testing for pain at McBurney's point (#1 in the photo above). I put a thumb in his navel, my little finger on his right hipbone, and pressed his abdomen sharply with my middle finger, wondering for a second as I did so whether McBurney had yet discovered and named this diagnostic spot. 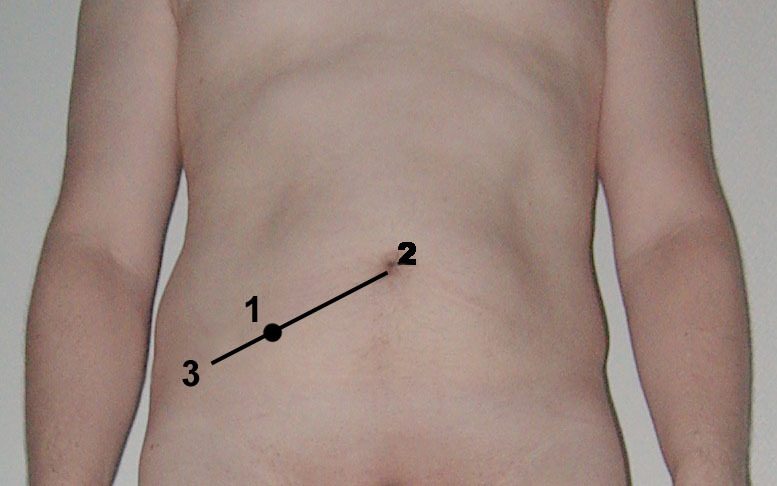 Pain in McBurney’s Spot was a specific diagnostic symptom for acute appendicitis. I pressed Aidan’s stomach there, then I released the pressure, he screamed, arched up off the table, and doubled up like a jackknife. A hot appendix for sure. I’d known I’d encounter one sometime. And with a mixed sense of dismay and excitement, I realized that the time had come for me finally to use the ether. No doubt about it, and no choice; if the appendix wasn’t removed, it would rupture. This video shows how to locate McBurney's point. 3) I didn't know until I read THE FIERY CROSS that lavender can be used to alleviate migraine symptoms. "D’ye think Mrs. Claire would have some lavender left?” Duncan asked, turning to Roger. “Aye, I know she has,” Roger replied. His puzzlement must have shown on his face, for Duncan smiled and ducked his head diffidently. Roger nodded his approval, feeling touched--and slightly shamed--by Duncan’s thoughtfulness. Here are some simple instructions for making a lavender pillow. For more about the use of lavender in treating migraine symptoms, look here and here. Fraser, close beside, felt him go and grabbed him, catching him round the middle and jerking him upright again. “Are ye all right?” he asked, low-voiced, his breath warm on Grey’s cheek. "Croakle dum-ho,” he said, breathless and dazed. 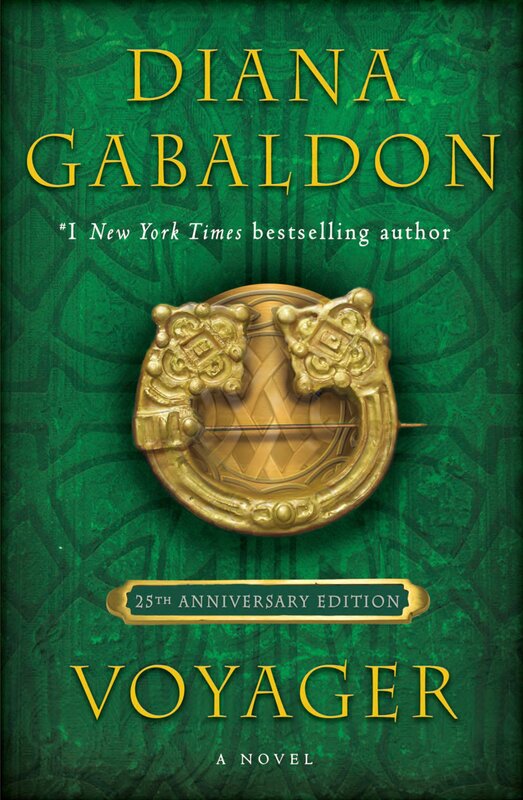 Fraser’s hands were still tight on his arms, steadying him. Fraser made a sound in his throat that might have been either derision or amusement--maybe both--and let go Grey’s arms. 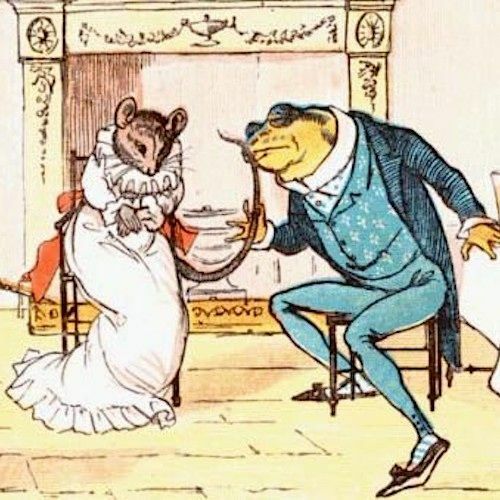 "The Great Lord Frog" comes to Lady Mouse to ask for the hand of her youngest daughter, and puts forth his various qualifications for marriage, only to come a-cropper on one small defect: "Pox upon it, I've never a tail." Unfortunately for Lord Frog, this objection is insuperable to Lady Mouse, "When we treat you at our cheese/Lack of a tail is all one sees/Fie, you live on bended knees!" and Lord Frog goes off indignantly in search of "one who values brains more than tails!" 5) Remember eight-year-old Jem's fascination with ants in ECHO? She crouched beside him, looking closer, and saw that, in fact, the ants weren’t drowning. 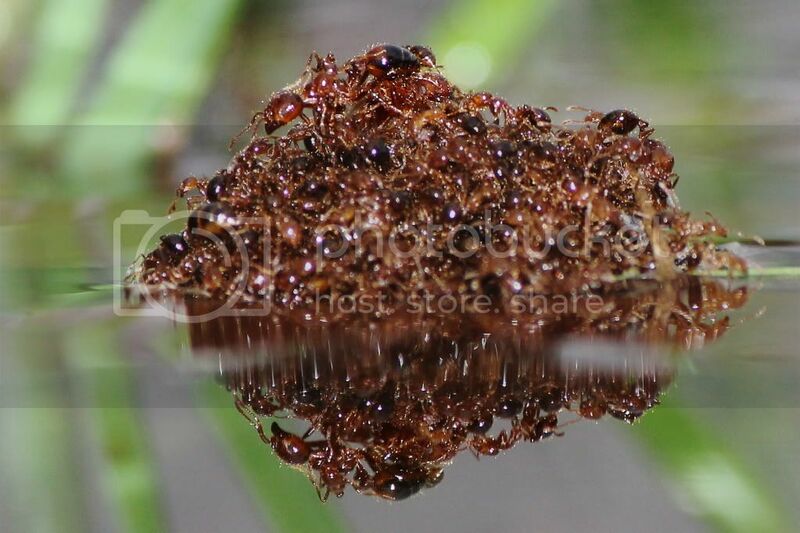 Single ants that had fallen in struggled madly toward the center, where a large mass of ants clung together, making a ball that floated, barely denting the surface. The ants in the ball were moving, slowly, so that they changed places constantly, and while one or two near the edge of the mass were motionless, possibly dead, the majority were clearly in no immediate danger of drowning, supported by the bodies of their fellows. And the mass itself was gradually drawing closer to the rim of the cup, propelled by the movements of the ants in it. Here's a brief video showing how they do it. Please note, I will not be posting FFF's next week because I will be attending the Grandfather Mountain Highland Games. 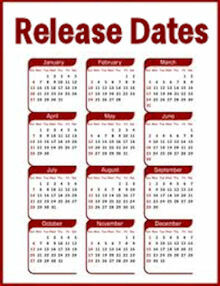 The FFF's will resume on July 19. The Lord Frog and Lady Mouse song is so interesting! It seems to be a cousin of the folk song "Froggie Went a Courtin'" that I grew up hearing on a Burl Ives album I had. (You should get a cameo in the series, all that red hair and exellent "herding" abilities over on Compuserve!) you are a natural fit!